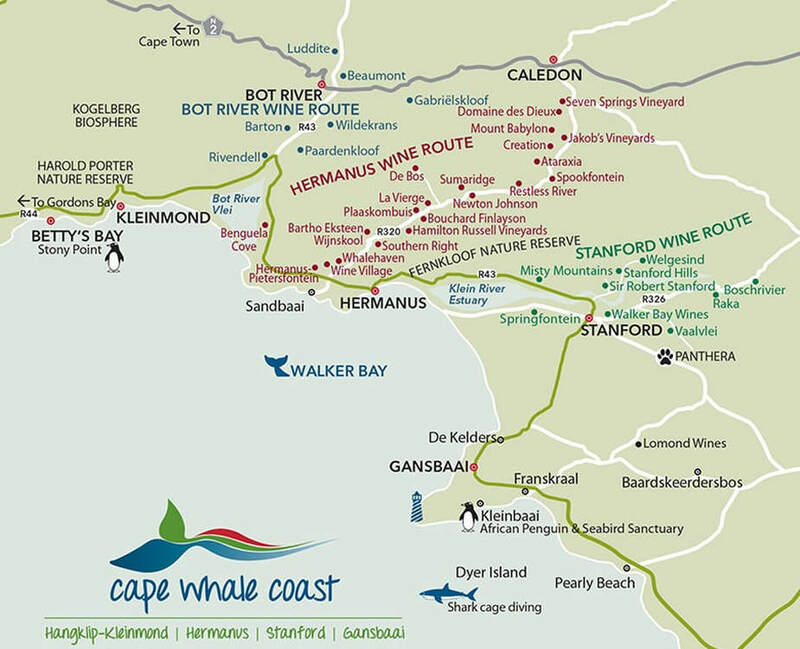 Hermanus has a high concentration of Wine Farms and Wine Estates, with the entire valley called Hemel-en-Aarde (Heaven and Earth) and rightly named too, as it has outstanding mountain scenery and lush farmlands - the valley is split into 3 Wards - Hemel-en-Aarde, Upper Hemel-en-Aarde and Hemel-en-Aarde Ridge. Listed below are ALL of the Wine estates of Walker Bay from Elgin thro' Hermanus and Stanford to Elim and Napier. Some wineries produce and offer excellent - Olives, Olive oils, Honey, Chocolate and Food and Wine pairings. Many wineries also have excellent Restaurants offering Breakfast and Lunches - some are open for Evening Dinners. C. Marshall; Elgin Ridge; Belfield; Elgin Valley; Thandi; Paul Wallace; Charles Fox; Glen Erskine; Kingsbridge; Oneiric; Almenkerk; Arumdale; Spioenkop; Highlands Road; Sutherland; and Barry Gould. Registered Cape Wine Tour Guides with the Cape Wine Academy.